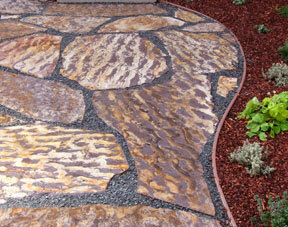 One of our clients calls Three Rivers flagstone “purple zebra,” which is a pretty accurate description. 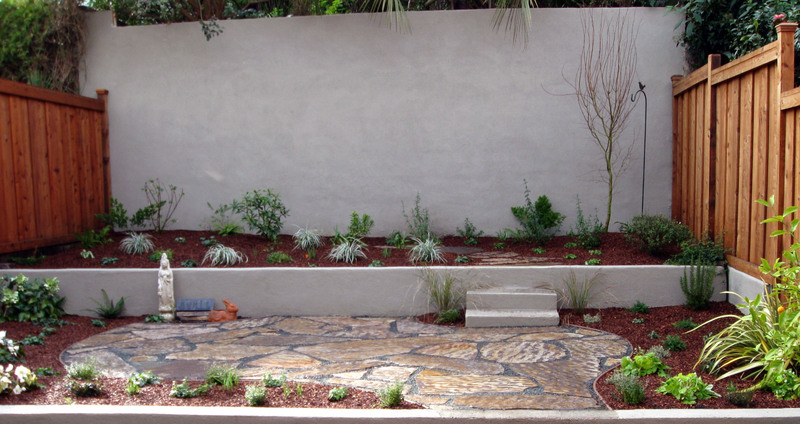 It always catches our clients’ eyes when they visit the stoneyard, though they often balk at the price, as it became really expensive a few years ago and is probably the most expensive flagstone commonly available in the Bay Area. It’s from one of the largest flagstone quarries in the United States, located up in the Sawtooth Mountains in Idaho. The quarry wanted to expand and the Bush administration, in their inimitable way, told them to go right ahead and not worry about doing an environmental impact study. An environmental group, the Western Watersheds Project, which owned a wildlife preserve adjacent to the quarry, then sued, and a judge agreed with the environmentalists that yes, U.S. law does require environmental impact studies, and temporarily shut down work at the quarry. Everyone settled out of court and the price then went up a couple of hundred dollars to around $750/ton. I’ve seen the stone described as a type of quartz-sandstone and as argillite. Answers.com defines argillite as “an intermediate between shale and slate, that does not possess true slaty cleavage,” which sounds about right, except that I would add that Three Rivers is really hard and heavy. (Can I say that I prefer my stone with a bit more cleavage? It’s true. Cleavage is the tendency of stone to break cleanly.) The swirls of color in Three Rivers come from irregular mineral layers which look cool but make the stone inclined to break irregularly. The patio in the photo, for instance, has rougher, wider joints than I would do with a cleaner-breaking stone like a sandstone. To get tight joints with Three Rivers, you pretty much have to cut everything with a saw. We usually only use Three Rivers for stepping stones, paths, and small patios; it can look too busy when used for larger areas. Quarriesandbeyond.org has links to info about the Three Rivers quarry on their list of quarries in Idaho. This entry was posted on Tuesday, February 17th, 2009 at 10:32 am and is filed under flatwork, stone. You can follow any responses to this entry through the RSS 2.0 feed. You can leave a response, or trackback from your own site. Beautiful stone. I would love to see it in person. A bit to far for my Ranger to go but the only thing stopping me is the price. $750 a ton is a bit steep. This stone is absolutely beautiful. I have been looking for unique flagstone and this really stands out from the rest. I would also agree the price is a bit steep but it sure is worth it if you have the cash! I am looking to buy about 100-150 sf of this three rivers to complete a patio I laid in 2002 when it was readily available. Do you know of any one who might have that amount to sell? I want to finish my fireplace hearth and need only 3 or 4 sq. ft. Is there anyone near Murrieta, Ca. who might have a few pieces of Three Rivers available? I haven’t seen it for sale in a few years, but I haven’t been looking, so it’s possible it might still be available. I would google Three Rivers Flagstone and contact all of the quarries that carry it or used to quarry it. Good luck. Has anyone found some? I just need a 35-100 square feet. The stoneyard in my area says the quarry is closed. It’s years since I saw it for sale in the Bay Area.